They become Magician, Thief, Priest and Fighter when a magical book guides them upon a quest that pits them against magic, demons and ‘The Hawk,’ an evil hunter of men. I have a cool and shady bamboo hut close to the beach with ample food and if not ‘all mod cons’ then at least I’m not slumming it completely, after all, there has to be a shelf for my ten books, right? My second book is going to be ‘Living Wild’ by Bear Grylls. Not only will this ex SAS survival expert be able to tell me what I can eat on the shoreline, just in case you didn’t book me into first class... but it is also an incredibly entertaining read. This guy can find food and water in the middle of the desert, warmth and shelter in a blizzard and how to make a worm sandwich really appetizing... However, I hope you do turn up because I will be leaving the worm sandwich to you because I’m vegetarian, I’ll happily deal with any dangerous carrot dishes that come up... but seriously, his books are really interesting if you fancy something VERY different to read and my island is an ideal place for it. I’m now looking at personal favourites, books that I’ve read time and time again with their worn, well thumbed, well beyond ‘slightly foxed,’ pages. My all time favourite author is John Steinbeck and my two books are The Grapes of Wrath, which is one of his better known books about families living through the great depression in the thirties, and Cannery Row. My second choice here isn’t one of his better know books, I almost chose Of Mice and Men, which is fantastic, but Cannery Row was the book that first got me into Steinbeck. It tells the story of a small group of ‘down and outs’ living close to the fish canning factories in Monterey California, again back in the great depression of the 1930’s. It’s a totally engaging read and I’m always happy to pick it up again. Steinbeck’s writing is timeless and every word id placed perfectly, the grammar by modern standards is less than perfect but doesn’t spoil the read. Books five, six and seven are the books and authors I’m currently reading. I have Heir of Novron with me. It’s book three in the Riyria Revelations series by Michael J. Sullivan. I just loved the first two books and can’t wait to crack into this one. Sullivan writes fantasy but with a good dose of ‘tongue in cheek’ humour that really in endears you to the characters. The next is ‘Trapped,’ by Kevin Hearne, which is the fourth in his Iron Druid chronicles. They follow the exploits of the druid, Atticus O’Sullivan who looks to be 21 but is actually over two thousand years old. His dog Oberon is one of the best characters in the stories, the two of them can speak telepathically and the conversations are hilarious! The last of my current books is ‘Rome - The coming of the King’ by M.C.Scott. She used to write as Manda Scott and her Boudicca books were a real inspiration to me when I was writing my book Shadowland. She is an awesome storyteller with a tremendous grasp of historical facts that made me determined to learn as much about the period as possible as I wrote. The coming of the King is actually the second in her Rome series; the first one was fantastic and ties in nicely with the Boudicca books. I think the mark of a great storyteller is to be able to take factual events and weave a spellbinding story amongst those events. Taking real characters that once walked our earth and letting them breathe again upon the pages of a book - read Manda... or M.C Scotts books! Okay, getting to the end of my small library and I’ve packed a few by fellow Indie authors. These are the writers who, like me, do not have the advertising and political clout of the big publishing companies behind them, yet they’ve written some fantastic books that cry out to be read. Rod Tyson has now published several books but the one I’ve packed is The Orphan Stone. This is a Young Adult book but as a full fledged adult I thoroughly enjoyed it. It is one freaky, scary story that steps over the boundaries into the paranormal. It’s hard to put down and has to be read with the lights on... or in my case, with a flickering candle in my droughty bamboo hut! I also have The Wake of the Dragon-A Steam Punk Adventure by Jaq D. Hawkins. This is my first dip into the steam punk genre which is sort of a Dickensian era background with lots of airships and people in tall hats and crazy glasses. 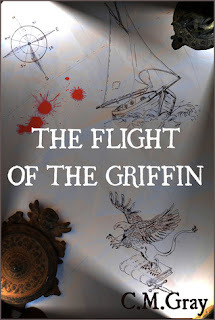 Hawkins tells a great story and paints a wonderful picture of a world filled with flying machines and eccentric piratical characters. If you’re looking for a couple of great Indie authors to check out start with these two... and me of course with my books Shadowland and The Flight of the Griffin! Which leaves me with one last book and for this I’m going to offer something a little light hearted. It is very difficult to rhyme, or it is at least for me. However, ‘8: The Previously Untold Story of the Previously Unknown 8th Dwarf’ by Michael Mullin is an incredibly well crafted rhyming story of Creepy, the last of the seven dwarfs that you never knew existed. He was twisted and moody. A freak to the letter. Calling him ‘Creepy’ didn’t make things much better. He had nothing in common with his cheerful housemates. Who were always so thrilled about the things that he hates. Thanks so much for stopping by, Chris. I'm packing my bag and I'm on my way, hope you're willing to share those books with me! Is that not the greatest post you've ever read? Want to hear more from Chris? Then I suggest you read his book! And you know how you can do that? Well, Chris has graciously agreed to give away three e-copies of his book. So get to entering, because you won't be disappointed! 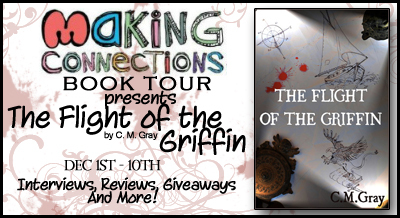 Born in Essex, England C.M.Gray has since been lucky enough to live and travel in many countries around the world. In fact he has lived more time outside of England than living there! Home now is just outside of Barcelona, Spain in a house in the middle of the forest with his Dutch born wife and two children. C.M.Gray’s writing is mostly fantasy and many of the experiences he has had in Asia, Africa and the Middle East come to life in his writing. The Flight of the Griffin follows the adventures of a group of young orphans as they battle demons and bandits on a magical quest to stop the world tipping into Chaos, while his second book, Shadowland blends fantasy with history as an old story teller takes his audience back to Britain's dark ages in a pre Arthurian legend. Thank you for the donation for this donation. 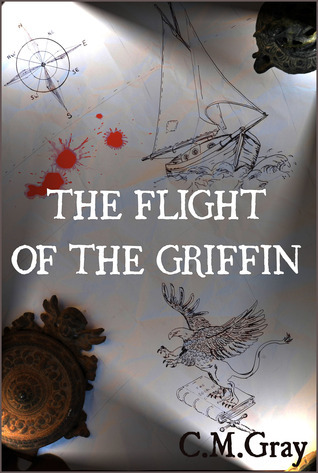 I would like to read Shadowland and The Flight of the Griffin. Of your list The Wake of the Dragon-A Steam Punk Adventure by Jaq D. Hawkins sounds good and so does The Orphan Stone. I like young adult books and it sounds good since "it is one freaky, scary story that steps over the boundaries into the paranormal". Thanks again. Thank you for your donation Chris. I would love to read The Orphan Stone. I love scary stories!